The ship's combat systems can use target designation data from the ship's active and passive sensors, from other ships in the fleet, from surveillance aircraft or via a communications link from the ship's helicopter. 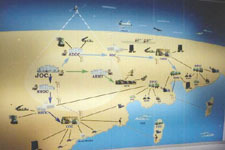 The multi-channel defence suite is capable of engaging several targets simultaneously. The ship is equipped with the Moskit (Mosquito) anti-ship missile system with two quadruple launchers installed port and starboard of the forward island and set at an angle about 15 degrees to the horizontal. The ship carries a total of eight Moskit 3M80E missiles, NATO designation SS-N-22 Sunburn. The missile developed by the Raduga Engineering Design Bureau in Dubna near Moscow, is a sea-skimming missile with velocity Mach 2.5 and armed with a 300 kg high explosive warhead or a nuclear 200 kiloton warhead. The range is from 10 to 120 kilometres. The launch weight is 4,000 kg. The missile is an autonomous system with terminal homing, operating on the fire and forget principle. The air defence system is the Shtil surface to air missile. Two Shtil missile systems are installed, each on the raised deck behind the two-barrelled 130 mm guns fore and aft of the two islands. Shtil is the export name of the SA-N-7, NATO reporting name Gadfly. The system uses the ship's three dimensional circular scan radar for target tracking. Up to three missiles can be aimed simultaneously.The missile range is up to 25 kilometres against targets with speeds up to 830 metres per second. The ship carries 48 Shtil missiles. 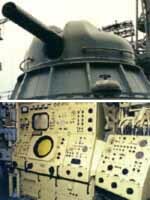 The fire control system can be used to control the ship's artillery system. The ship's 130 mm guns are the AK-130-MR-184 supplied by the Ametist Design Bureau and the Topaz Plant both based in Moscow and the Frunze Arsenal Design Bureau and Production Organisation in Saint Petersburg. 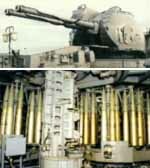 The system comprises a computer control system with electronic and television sighting, a double barrelled gun mount equipped with a Kondensor optical sighting system and an interface unit to the ship's weapon command system. The gun is capable of firing contact and proximity fuzed ammunition, and practice and discharge rounds. The gun has a multi- band radar control system and the television and optical systems provide a standby fire control system. The gun can be operated in fully automatic mode from the radar control system, under autonomous control using the turret mounted Kondensor sighting equipment and the gun can also be laid manually. Rate of fire is between 20 and 35 rounds per minute. The ship has four six-barrel AK-630 artillery systems. The AK-630 gun fires 30 mm ammunition, high explosive fragmentation incendiaries or fragmentation tracer projectiles. The maximum rate of fire is 5,000 rounds per minute. The muzzle velocity is 880 metres/second. Range is up to 4,000 metres for low flying anti-ship missiles and 5,000 metres for light surface targets. The gun is equipped with radar and television detection and tracking. The ship carries a store of 16,000 cartridges for the AK-630. The Project 956 destroyer has two double torpedo tubes, diameter 533 mm installed port and starboard. The ship also has two six-barrel anti-submarine rocket launchers, RBU-1000, with 48 rockets. The RBU-1000 launchers are installed two decks below and to either side of the helicopter launch deck. Range is 1,000 metres. The rockets are armed with a 55 kg warhead. The ship's helicopter pad accommodates one Ka-27 anti-submarine warfare helicopter, NATO codename Helix. The helicopter is supplied by the Kamov JSC of Lyubertsy, Moscow and Kimertau Research and Production Association, Bashkartastan. The helicopter can operate in conditions up to sea state 5 and up to 200 km from the host ship. The helicopter is equipped with radar, sonar antisubmarine torpedoes, antisubmarine missiles,depth charge rockets and depth charges. The Project 956 destroyer is fitted with an electronic countermeasures system. 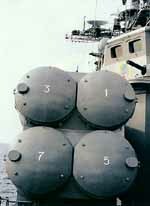 The ship carries a store of 200 rockets for the two decoy dispensers, model PK-2. The hull has a flared profile throughout the entire length of the ship. The bow is elevated and the ship has a two island superstructure and two masts. The ship is fitted with roll damping fins for increased stability. The ship is equipped with three navigation radars, an air target acquisition radar, and fire control radars for the 130 mm gun and the 30 mm gun. The sonar suite includes active and passive hull mounted search and attack sonar. The ship's propulsion system is based on two steam turbine engines each producing 50,000 horsepower together with 4 high pressure boilers. There are two fixed pitch propellers. The ship's maximum speed is just under 33 knots. At a fuel-economic speed of 18 knots the range is 3,920 miles. The endurance is 30 days. The Sovremenny Class Project 965 destroyer has anti-ship, anti-aircraft, anti-submarine and coastal bombardment capability. The Besstrashny Sovremenny Class Type 956 from starboard. The Shtil missile system showing both the missile and control station. One of the AK130-MR-184 130mm Guns and loading system. Line drawing of Sovremenny Class Type 956. HONG KONG - It is hard not to admire China's ability to play a long game on the international stage even while domestic policies are twisting about and instability is in the air. The past few months have seen China take advantage of regional disorder and economic preoccupations to make the biggest strides since 1995 toward fulfilling its long-term goal of taking over the whole South China Sea. It has done so with remarkably little protest from neighbors, or indeed from major powers which have a vital strategic interest in the sea-lanes. Far from spurring regional solidarity against China's creeping maritime hegemonism, the moves appear to have exacerbated divisions within the Association of South East Asian Nations. Yet the expansion of ASEAN to include Vietnam, Laos and Burma was speeded up by a desire of the maritime states that entry of Vietnam would enhance regional solidarity. China has added heavily to its structures on Mischief Reef, a mere 135 nautical miles off the Philippines, which it occupied in 1995. Although it pretends that these are being built by and for fishermen, none of the neighbors doubt their military function. China also appears to have stepped up its naval presence (frigates, supply ships and a research vessel) in the area, which is well within the Philippines' 200-mile exclusive economic zone. The pattern dates to 1992 - offer to talk about the sea and ''joint exploitation'' with neighbors, while proclaiming total sovereignty and creating new realities when opportunities arise. The opportunity has been provided by the neighbors' preoccupation with the economic crisis, the gratitude they are supposed to feel for China's defense of currency stability, and the change of government in Manila. The Philippines is not only militarily the weakest of the littoral states. From China's point of view, its offshore rocks and reefs are the most valuable strategically. The area is not far from small offshore oil fields exploited by the Philippines but claimed by China. And 300 miles to the north are shoals where China has put down a marker; these lie almost due west of Subic Bay and close to the main shipping lane. The Philippines was clearly undecided on how to respond to the latest Chinese expansion. The government was apparently aware of developments long before it announced them. This limited whatever value diplomatic and international protest might have had. President Joseph Estrada wants U.S. involvement, but Manila knows it cannot expect help from its defense pact with the United States. Washington has advised ''restraint.'' A U.S. proposal for an international forum, including itself, is a nonstarter; opposition from Malaysia and Vietnam makes it easy for China to shrug it off. ASEAN's position looks ever less meaningful. It still talks of diplomatic solutions while Beijing creates facts. China meanwhile refuses to talk on anything other than a bilateral basis with littoral states, successfully brushing off attempts at multilateral discussions. ASEAN's ''plan of action,'' from its December meeting in Hanoi, calls for a council to resolve potential conflicts. But resolving conflicting sea claims with each other, even if possible, is marginal to the wider issue of China's claim to everything. Malaysia is currently especially keen on dialogue rather than confrontation with China. It can afford that for now because it has spent enough to build up its own air and naval capability to deter China from making moves in its claimed area, the southernmost part of the South China Sea, which is also the richest in oil. Vietnam has showed enough willingness since 1992 to resist Chinese encroachments on its southern waters that Beijing has turned its attentions to the Philippines. Manila relied for so long on the U.S. presence that it has scant way of defending itself. But China will pick off each in turn, just as it grabbed the Paracels from a divided Vietnam in 1974, and used force against a diplomatically isolated Vietnam in 1979 and 1988 to curtail its presence in the Spratlys. China has come a long way in the South China Sea in 25 years. At this rate the sea will all be Chinese by 2050. The long game will have paid off.